Orders of items in stock typically take 2 days to process, except during holidays. Items made to order, pre-ordered, and custom orderd take 2-4 weeks production and processing time. License plates and kennel tags typically take 1-2 weeks. 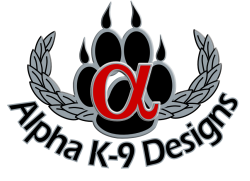 Custom made to order patches, paracord bracelets, and hats typically take 3-4 weeks. Custom made to order apparel and mugs take 1-2 weeks. Items ordered through our main Apparel Store are processed by Spreadshirt which usually takes 1-2 weeks. Changes to orders should be done within 1 day of original order date for any item purchased. Custom made to order items already produced can not be changed. Items in stock are usually shipped within 1-2 days. During holidays please allow up to 5+ days. Custom made to order items are shipped 1-3 days after production. All items are shipped standard first class mail with USPS. Shipping with USPS is usually 2-10 days depending on your area and holidays. Items ordered through our main Apparel Store are usually shipped 1-2 days after production. So you should get your item within 1-2 weeks of order.